Dang! February is a short month. This means I’ve only got five days to complete Ms. February’s sweater if I am going to stay on track. 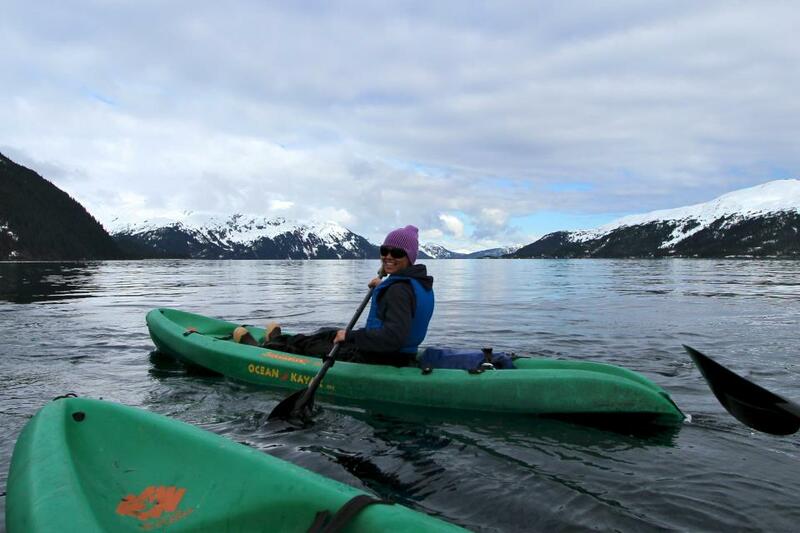 Last month, Ms. January (aka Beth Nordlund) and I had a very specific mission. We needed to create a look for Object Runway a wearable art fashion show held every January here in Anchorage. I had a lot of fun designing this piece and watching Beth rock the runway while wearing. Beth on the runway looking amazing. But it’s a new month, that is almost an old month, so I better get busy. New month, New model, New sweater. Without further ado, please allow me to introduce you to Mereidi Liebner. 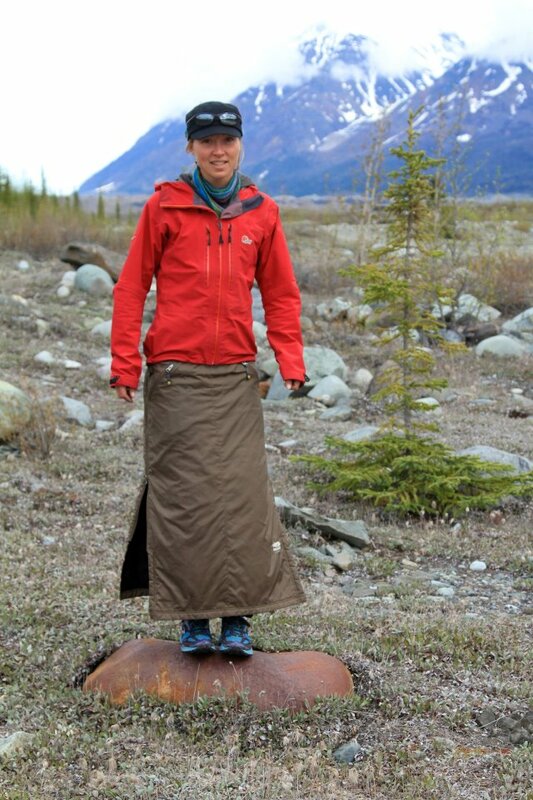 Mereidi is s life-long Alaskan, boat captain, marathon runner, caribou hunter, knitter, and downhill skier. As you can tell by the description, except for the knitting, Mereidi doesn’t sit still much. 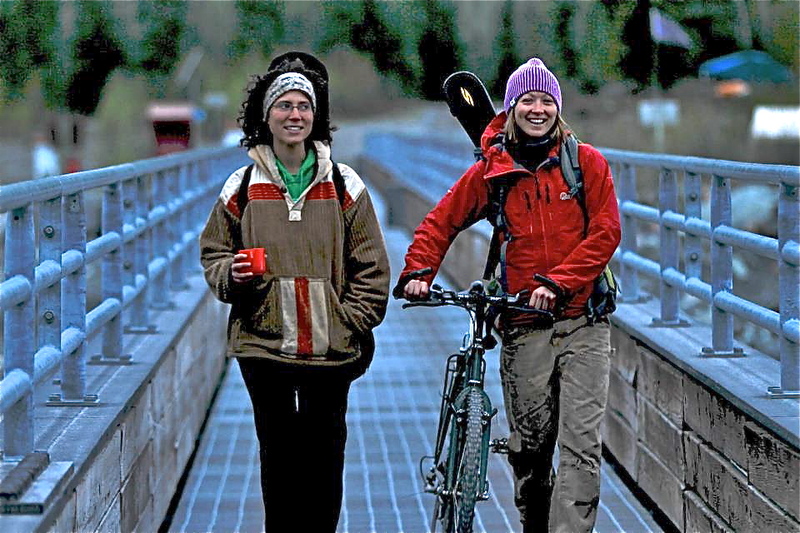 Here is Mereidi with her friend Allison who is also my friend. When Allison heard I was looking for a svelte runner type to be one of my models, she introduced us. Thank you Allison! Mereidi wants a sweater she can work and play in. 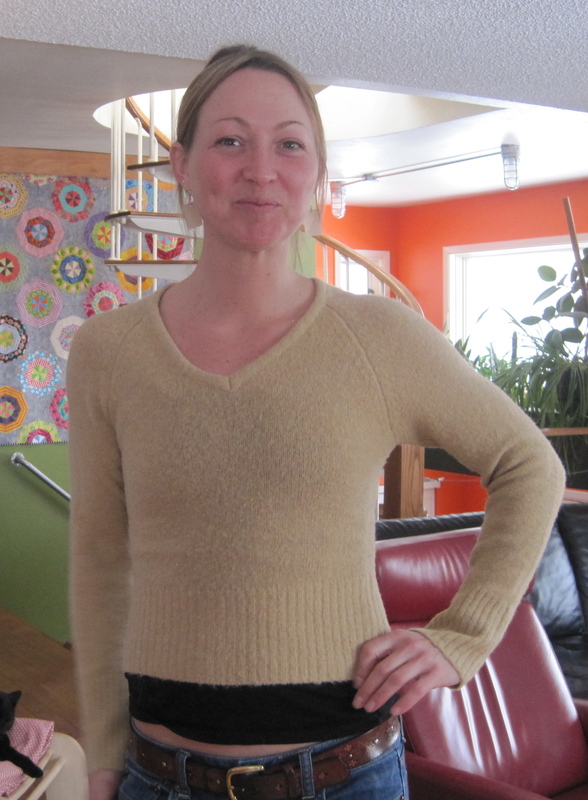 Last Thursday, she came over to my house with a collection of some of her favorite garments. I had her try them on. While she did this, we talked about what she liked and didn’t like about each piece of clothing. 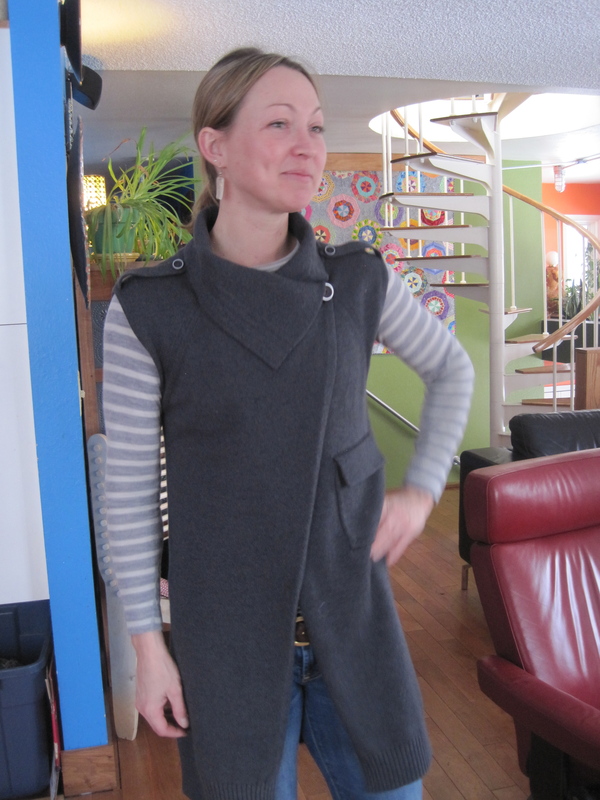 Mereidi likes the shoulder seams and the length of the sleeves of this sweater, but feels it is a bit short. I like it. Mereidi likes all different types of collars especially asymmetrical ones. We both really like all aspects of this hoodie. The hood at the collar has an original shape. I also like the patchwork lines of the piece. The back also has great lines. 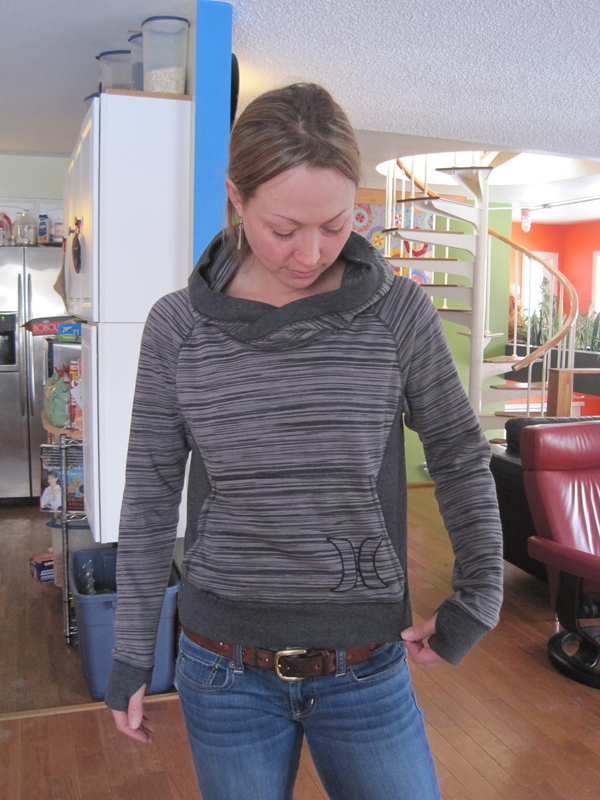 Then just for kicks, I had her try on some of the sweaters I had already made. Yes, they are all a bit big, but still good fodder for inspiration. Mereidi liked the unusual collar of this sleeveless tunic. I agree- it looks great on her. I really like the girly skirt. 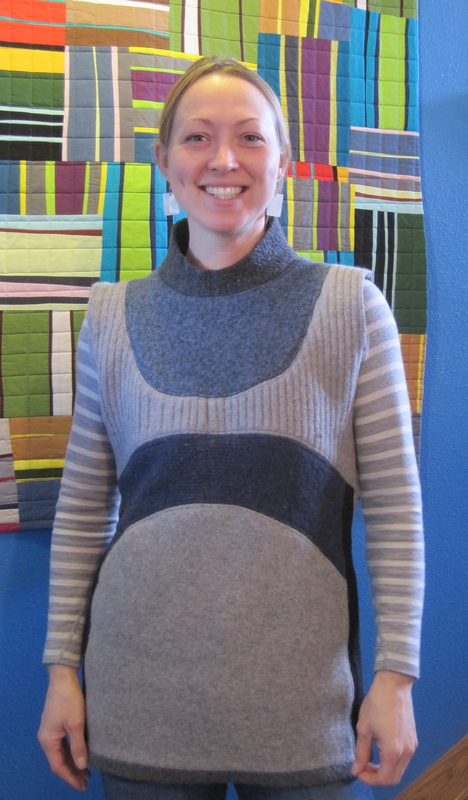 I made this from the pattern I created for Beth’s sweater dress. Mereidi liked it, but felt it was a bit to dressy for everyday, and she wants an everyday sweater. 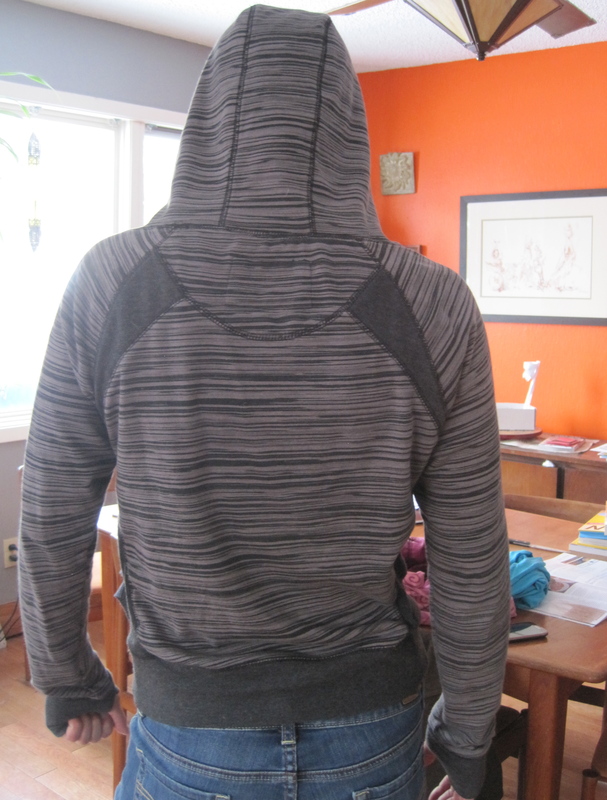 Here is the same sweater from the back. I think it is so cute! Especially the bottom half of the sweater. Let’s just say, I think it has potential. We like the length of the tunic and the sleeves, as well as the little pockets. But I need to change the lines of the front of tunic. Here are the little pockets you can’t see in the full shot. 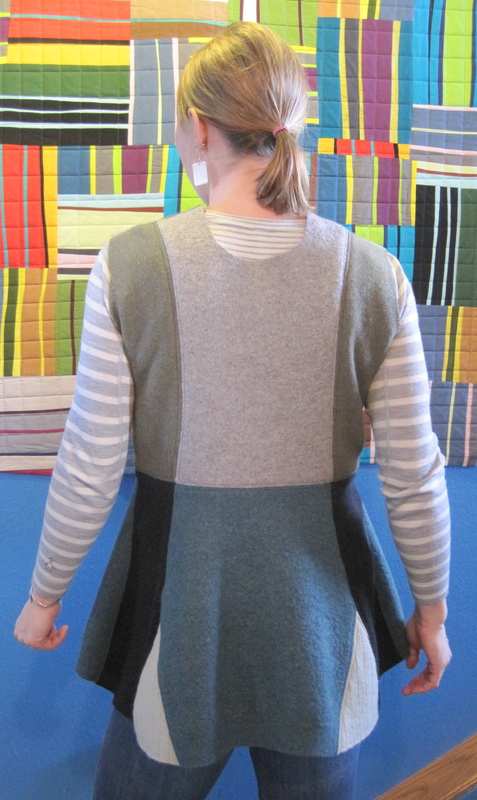 They are the pockets from a cardigan that have been repurposed to be pockets on this tunic. I love doing that. Here is what we decided. 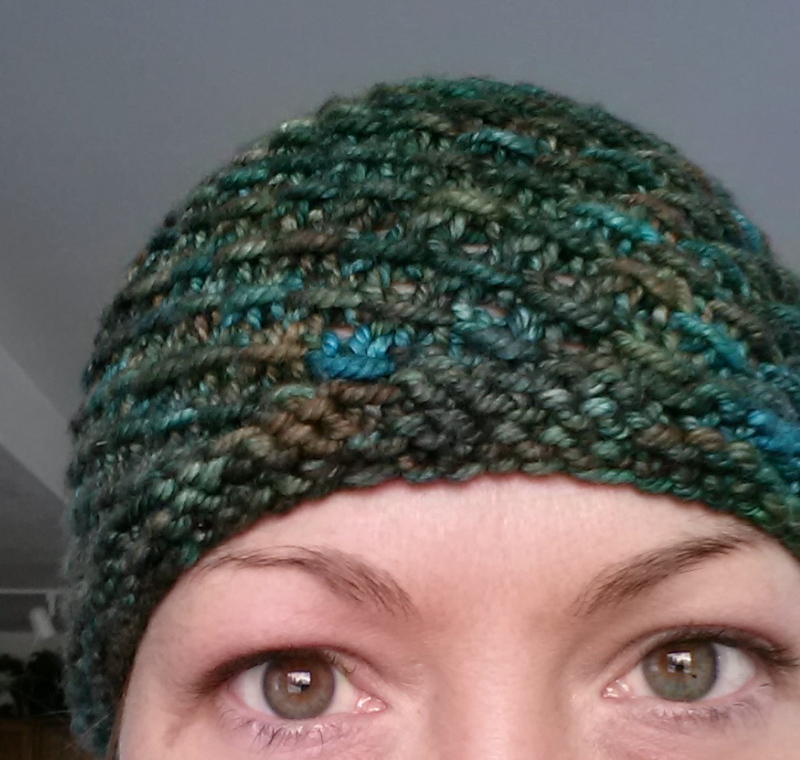 Mereidi just knitted this hat, and she loves the colors. I am going to be working with this color palette to design her sweater. Isn’t it beautiful with her eyes? As is the situation for most of us, we find a great dress or blouse or sweater–we love the fit, but the color is not right. Still we buy it and wear it knowing it’s the best we can do. Mereidi mentioned this several times when we looked at her clothing. Hopefully, if I get this right. 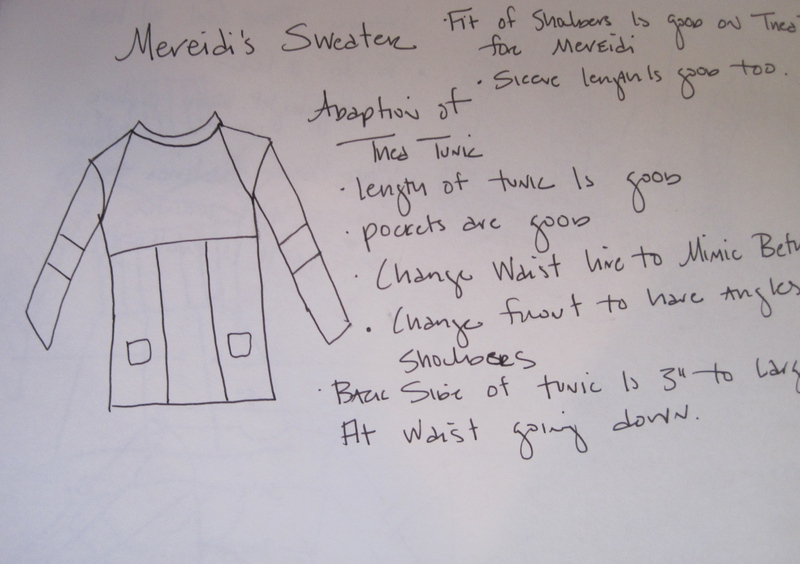 I will design a sweater for Mereidi that is not only attractive and comfortable, but also in her favorite palette. Mereidi wants a tunic with long sleeves in shades of greens. 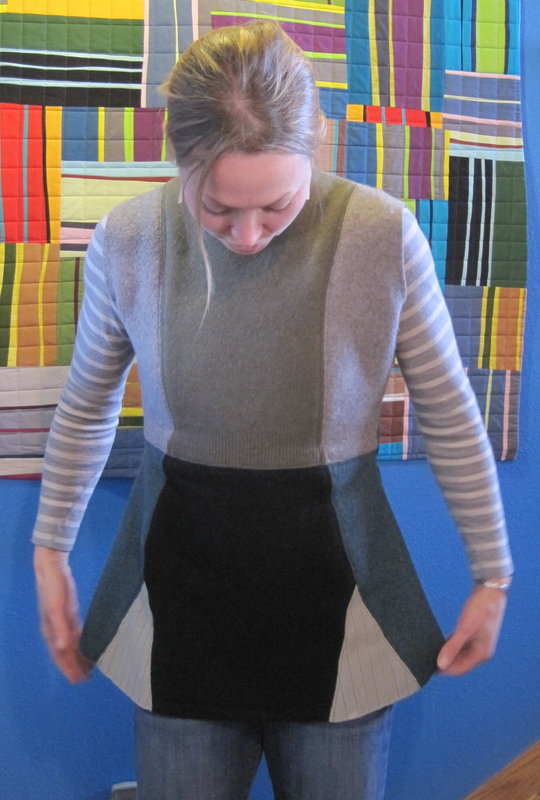 She wants front pockets, diagonal shoulder seams, and an unusual collar. Can I do it right? 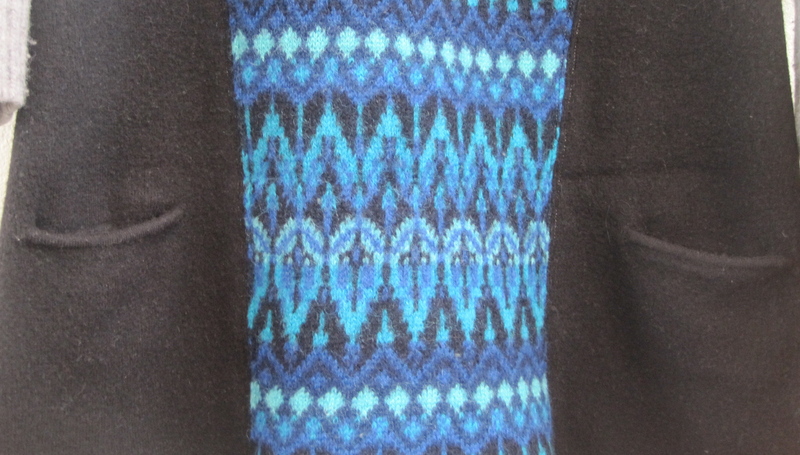 I am still uncertain about the horizontal seam in the middle. That is going to be tricky to get that right. Okay, the first sketch is done. The next step is to create the palette. Stay tuned for more stitching stories. Comments and suggestions? I’d love to hear them. 24 Feb	This entry was published on February 24, 2013 at 1:22 PM. 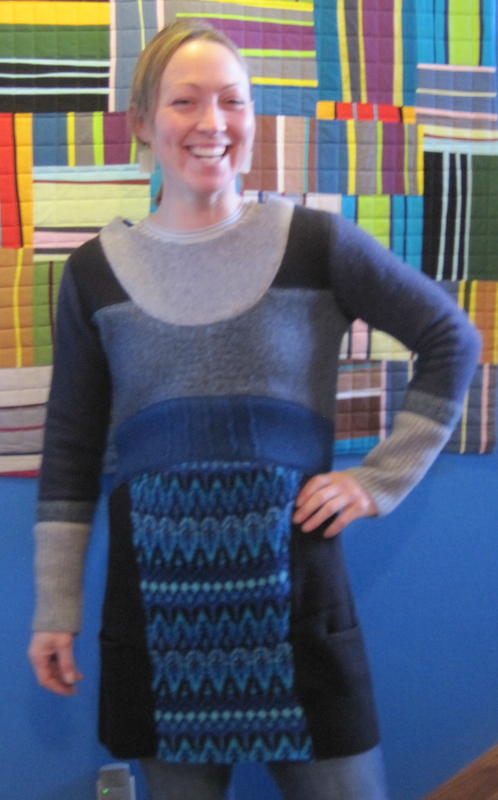 It’s filed under ArctiCouture and tagged Ms. February, Ms. January, Object Runway, Sweater Design. Bookmark the permalink. Follow any comments here with the RSS feed for this post. Mereidi is great to work with! Thank you Allison.